Thank you to JA Families! On behalf of the JA PTO, we want to thank all of the JA Families, Friends and Staff that attended and volunteered their time to make the 56th Annual Lawn Party a success! We had a beautiful day and a lot of fun! Thank you to the vendors that attended: Dr. Todd Rowe Orthodontics; Leominster DPW; Vantel Pearls; Thirty-One; Juice Plus; Jamberry; Stella & Dot; Rescom Exteriors; US Tae Kwon Do Center; Hills Home Foods Market and Wachusett Dirt Dawgs. Also thank you to the Leominster Music Program for our entertainment! See you next year! Tomorrow is the day.... LAWN PARTY!!!!! Thank you to everyone who signed up to volunteer for Lawn Party on Saturday, May 21, 2016. Here is some important information you will need! With over 200 volunteers working over the course of the weekend we are not able to contact each person to confirm. Please plan to arrive for the shift you indicated on your rsvp. If you forgot what time you signed up for please email cariemiele@comcast.net as soon as possible. We will do our best to reply in a timely manner. Once the event starts we may not be able to response to messages. Volunteers should check in at the Volunteer Registration table at the front door of JA 15 minutes before the start of your shift to receive your shift assignment. We also welcome walk-on volunteers. There will be a list of open positions for each shift at the registration table. Most assignments are outdoor assignments. Please wear sunscreen and a hat. You are encouraged to bring your own bottled water or there is water available for sale in the cafeteria. Baked goods and cakes should be delivered to the school throughout the day Friday or before 10am Saturday morning. Most importantly, come enjoy the event with the good feeling that you are supporting your child’s educational opportunities. As the school year is coming to a close, We have some dates we would like you to mark on your calendars! Saturday, May 21: JA Lawn Party! We are still in need of volunteers that day. Also baked goods are needed for the bake sale and cake and snacks are needed for the cake walk. Wednesday, June 1: Books and Beyond Ceremony! Parents are invited to see your students receive a medal! Monday, June 6th: Field Day! Volunteers will be needed for that day. Look for the notice in the next couple of weeks. During May, when you visit Hannaford at Twin City Plaza,the purchase of a blue Hannaford Helps Reusable Bag will help JA receive $1 per bag! Box Tops & Cabaret this Friday! 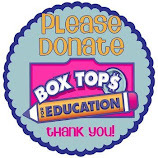 Box Tops collection is an great way to raise money for our school! If you would like to participate in the raffle that will be pulled at our Books and Beyond Ceremony please send your Box Tops in by this Friday morning, May 6th. Make sure to send them with your child's name and homeroom in bundles of 10. Our first annual Cabaret will be held this Friday, May 6th at 6pm in the school cafeteria! Come and enjoy as the 5th grade band and chorus members showcase what they have been practicing all year. All are welcome! This event is $5 per family and will raise money for JA music program. May is a busy month for the JA community! This week, May 2nd-6th we celebrate and thank our teachers and staff! Click here for Details about the Week and Sign Up to help! Come to our PTO Meeting, Tuesday, May 3rd at 7pm for up-to-date school info and for our own Election Night! There are many Board positions open due to parents having to graduate their 5th graders and leave JA. This is a great opportunity to join the Board and help support all of the wonderful events JA offers your students. Attached is a link to the position descriptions you may be interested in. Friday, May 13th is Father/Son Night. This year's event is for all of the race car enthusiasts and will be held at RC Excitement on Bemis Road, Fitchburg. Here are the details. Save the Date - Saturday, May 21st is the JA Lawn Party watch for info to come home on all of the different aspects of the event needed to make it a success - raffle baskets, pot luck donations, baked goods, and VOLUNTEERS! Also in May, when you visit Hannaford at Twin City Plaza, the purchase of a blue Hannaford Helps Reusable Bag will help JA receive $1 per bag!